Ellen Kamae was a half sister of Joseph Kauhimaka my Great-great-grandfather through my FERNANDEZ line. They shared the same mother Anahua. She was born in April 1858 and died at the age of 70 in March 1929. She is in the 1900 Census as Kamae Goo and her husband as Kim Goo. It states that she had four children with only two living… so will have to uncover where Ella comes in as only Annie and John are listed as children.. There are a few other children listed as a neice and boarder.. so perhaps one of these children were hanai’d or adopted as their own later. Ellen’s brother Joe Kauhimaka, sister Kuhihewa married to Aaron KANAI, and her mother Anahua are in nearby households. Goo Kim Fui and my great-great-grandfather LEE Toma were from the same province of China. Goo Kim was a contemporary and friend of LEE Toma which shows the link between my LEE and KAUHIMAKA lines much earlier in Honolulu history then the meeting of my Great-grandmother’s at Ma’eMa’e Chapel which later led to the marriage of their children / my grandparents Marilyn Han Jin LEE and Lino FERNANDEZ III. 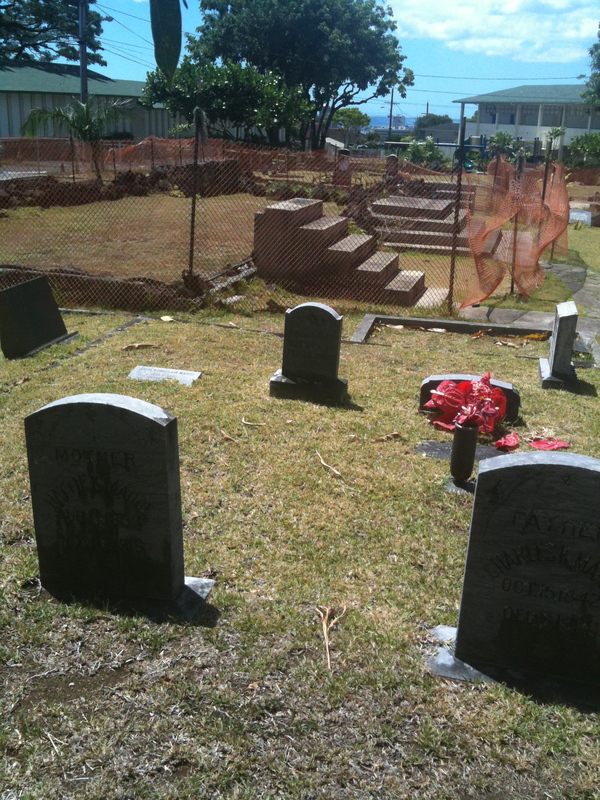 Both LEE Toma and Goo Kim Fui are buried at Makiki Cemetery in the Chinese Christian section. Goo Kim Fui precedes Ellen in death in 1908. He and Ellen Kamae are buried in a gated section on the lower walkway near the Wilder Street Corner. 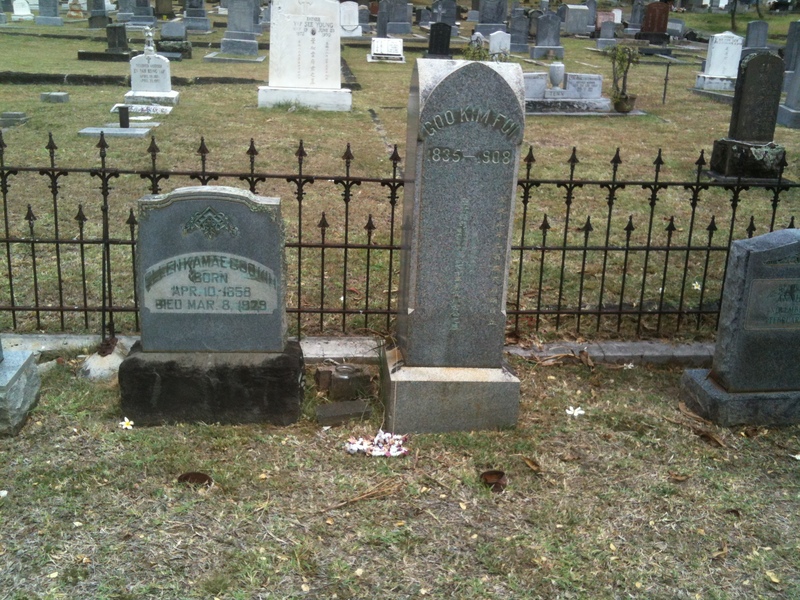 Their son John Kameeualani Yin Fook Goo Kim (1889 – 1963) is also in the family cemetery plot in a nearby grave. She was a remarkable woman dedicated to her husband’s Christian values in uplifting the Chinese community and building the Chinese Christian faith and following in Honolulu and beyond. She learned his language and traveled with him to Leen Tong to erect a church. “Mrs. Goo Kim accommodated herself to this change in life and work so gracefully as to make a strong impression upon her husband’s country folk.” Source: The Friend, Volume LXV, Number 6, 1 June 1908 Edition 01 – The State of Hawaii. An influencer in the elite circles of Honolulu life – Ellen’s prowess stood on its own and afforded her invites to the most posh events like those hosted by the Dillinghams or Queen Liliuoukalani. She hosted her own share of gala events like her husband’s 60th birthday bash in their Nuuanu home (on Liliha between Judd and Wylie). Ellen could often be found traveling with the who’s who of Honolulu on occasions like an impromptu lava viewing excursion aboard the steamer Kinau. 1878 – pupils for the Sabbath School at Makiki are from Mr. Goo Kim’s rice field in Waikiki. Mika Kauhao to Samuel Smith, then Samuel Smith to Ellen Kamae Goo Kim on Feb. 20, 1880, 4pm. 1904 Children: Daughters help with Sunday School at AALA MISSION. he married a Hawaiian lady, Miss Ellen Kamae, a most fortunate and happy union. Mrs. Goo Kim set herself to learn her husband’s language and succeeded remarkably well. In — therefore he and his wife went to Leen Tong and labored with such success that he was soon enabled to erect a Church building, for which he himself paid,and to gather a number of converts. Mrs. Goo Kim accommodated herself to this change in life and work so gracefully as to make a strong impression upon her husband’s country folk. After…years of successful evangelism the exigencies of business called Mr. and Mrs. Goo Kim back to Honolulu. Been busy with field research continuing at MaeMae Cemetery in Puunui. Nearly finished with photographing all the headstones and still have to transcribe to my spreadsheet. Then to compare to the items found in digital archives of other known burials to the site. Still need to map the stones and reach out to Kaumakapili Church to see what records and information they might have as well as sharing my research with them. I’m also spending much time in Facebook Groups – like Helu Papa Kūʻauhau and also the Native Hawaiian Genealogy Society (NHGSoc) page. Another useful resource has been the group Portuguese Hawaiian Genealogy. The camaraderie of the groups is infectious and there are many ‘ohana connections. Spent some time learning more of my North Carolina roots – and learned that some of my ancestors and family were brick makers and instrumental in building and supplying the brick for buildings like the Mills River Chapel Methodist church. The Chapel is one of a few antebellum churches in Henderson County and the only one used for worship since its construction. The King family farm passed this craft down through generations. Building more family history – brick by brick. Looking forward to the Akana ‘Ohana reunion coming up in mid-July and will be returning to Hilo where my Great-Great-Grandparents Wong Sing Akana and Kaili Kaapuiki made their home. My Great-Grandmother Ami Akana Lee was the eldest child. It will be exciting to meet many distant cousins in person for the first time after months of corresponding online. Finally a brick wall has been busted — and I’ll post a more detailed article about this find. In September, I discovered that Virginia K. Ayres – my husband’s great-grandmother – had a blood connection to the name KAMA. It turns out her birth father was known as Kama. Well I ran the search again on Chronicling America and a new article came up this time “Missing Girl has been found” … with his first name and the brother’s first name. Very exciting and now some concrete material to continue the search to find her blood kin and perhaps more of her story.